Looks like no snow at the N7GP operation, but according to Milt, N5IA "the wind sure did blow." 1370 CW Qs, and 1275 on SSB. 65 Mults for a total score of 437,320. LONG. Not for the faint of heart. The first comment is relative to the scoring. N1MM did not score the multiple county contacts, it did not score the DX mults, and it has no way to score for us operating on a county line (two counties = all contacts x 2). Consequently the posted score is subject to the official scorer scrutinizing the Cabrillo log. We believe it is close, and may be a bit low. Last year the 1st 7QP announcement came after my wife and I already had a planned family trip to the east coast. From the reports I have read, I missed a good one. I live only 3 miles from the AZ state line and Greenlee County. I have been intimately associated with Greenlee County for more than 60 years. I have a keen interest in making a showing from Greenlee County and have done that at times in the 160 Meter contests and ARRL Field Day. 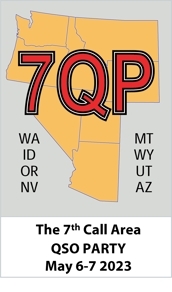 For this year's 7QP I had in mind doing a single op, portable FD style operation from Greenlee until Steve, N2IC, contacted me a couple of weeks ago about doing a mobile/portable operation from Cochise, Graham and Greenlee (setup three times in 3 counties). That got me to thinking and I suggested we do a multi-op in the County Expedition category. The enticement of X2 for all contacts was like "Wow! Where do I sign up?". I knew where we could easily access a location on the Graham/Greenlee county line that was not too far away from Duncan, AZ where I work. Steve agreed and the plan was put into action. Some other ops were invited and the local area club (Eastern AZ Amateur Radio Society = EAARS) agreed to support the activity with some of their FD antennas and their communcations bus and generator. Richard, N7XEU and I spent Friday getting all the equipment and antennas set up at the site. The location is on a ridgeline that is a watershed division between the Gila River basin and the San Simon River basin. What we discovered is a potential wind farm generating site. It is windy in the SW USA in the springtime but 30-40 mph winds do NOT make a 2-man antenna erection party a picnic. But, 12 hours of hard work made it happen. W7MCO and N2IC arrived in the late afternoon Friday to assist with final antenna deployment and to setup the radios and logging computers. This was our first try at using N1MM in this environment and in particular in this contest. An evening of tinkering with things and all was playing well. We shut down the generator at 10 PM and went to bed. The wind blew all night long and the travel trailer was like a boat on the ocean. The 7QP started at 30 minutes past sunrise at our location so we decided to forego any low band try and get directly to the upper bands. 20 Meters was open to the east coast and EU, so that is where the radios stayed for ~12 hours. As you can see from the Q count listing, it was the MONEY band. The antennas were a pair of C-3's for SSB and a 4-element HyGain 204BA for the CW station. 15 Meters showed no sign of opening. I made a contact with Dave, K1TTT, on 15 Meters, and it was marginal. Dave said he was working 10 Meters up and down the east coast but there was none of that east to west on either 15 or 10. As someone else mentioned in their post, there is no incentive to move bands if you have the mults. By late afternoon, we had all states but AK, more than enough DX for the 10 mults, and really had no more chance for the eastern VE Provinces. Consequently we rode 20 Meters until it died. That was where the rate was at. W7MCO and KE7DVB were able to operate the 20 SSB station for about 1 hour and 3 hours respectively. Both operators were able to establish some good rate and will be very useful ops for future operations. Steve moved the CW station to 40 Meters when the 20 Meter rate dropped and found 40 Meters to be great. His 2nd CQ was answered by a DL. Our 40 Meter antennas were double extended Zepps with the apexes ~50' AGL and broadside to the northeast. The Q count for 40 Meters CW indicates the success Steve had on that band/mode. The rate on 20 Meters SSB hung in there longer for me so I didn't move the SSB station to 40 Meters until 0200Z or so. I found 40 SSB to be very limited in number of stations. I worked all the "big guns" by S&P very quickly, and then found CQing to be fruitless. The 20+ QRN from the midwest storms really put a damper on the last 4 hours. We were visited late by WB7ONJ/m who had worked his way through Gila, Graham and Greenlee counties on US Highway 70. He was accompanied by Wendell, N7VQG. We were running low on fuel in the generator and didn't know which would give out first; the fuel, the Q's or ourselves. The generator did run 'til closing time and we made about 30 Q's the last hour. Many northwest 7 land stations that we were hearing reasonably well on 80 Meters did not respond to our calls. The 80 Meter antennas were also double extended Zepps, broadside to the northeast. We went to bed shortly after the ending bell, and slept ~5 hours 'til sunrise. Steve, Richard and I had all the antennas down, equipment stowed and the whole enchilada towed back into Duncan, AZ (XEU's QTH) by shortly after Noon on Sunday. Was it worth it? An emphatic YES!!!! We learned a whole bunch about what to do the next time. The only downer was the consistent high winds. The wind continued all day Saturday (higher velocity that Friday) and was still at 15-20 mph when we finished at midnight. But that beats the 100+ degree heat which is always prevalent for FD deployments in June. Did we have FUN!!!! Another YES! For a quickly planned "expedition" to an unknown site, and operation in an unknown contest format, we can say without a doubt that it was a success. Thanks to the organizers of the 7QP, all the state Captains and Co-Captains, and in particular to all the stations out there in radio land who enjoy contesting or just get on to give us crazies a contact. Thanks to all the stations who were participating in the NEQP, the InQP, and the MARAC who gave us a call. Obviously for us each multiple contact from those stations was a dupe, but that is part of the game. We had 66 dupes overall out of a raw single contact count of 1,401. That is 4.7 percent dupes. For those interested, N1MM played flawlessly on Dell desktops running Windows XP. Networking was with with a Netgear 802.11b router. A 15 mile 2.4 gHz wireless Internet connection was made to my home in New Mexico. CW keying was with WinKey and the SSB station was manual voice. I gotta get a voice keyer that will work with Windows. The transceivers used were competition grade Yaesu FT-1000-MP's. Finally, a BIG thank you to the EAARS club for their support of this activity and the use of their equipment. Thanks to W7MCO for his support, setting up the network and for operating some. Thanks to KE7DVB for stepping up and acquiring some contest skills. And last but not least, a big thank you to Steve, N2IC for his knowledge and superb operating skills, and to Richard, N7XEU for his equipment and mechanical abilities that were invaluable in the setup and takedown of the antenna systems. Without both of these guys, the result would have been significantly less impressive. 73 to all, and we look forward to the 3rd running of the 7QP. N5IA's tower trailer with two Force 12 C-3's and 40M and 80M double extended Zepps for the SSB station. Native spring cactus blooms at the 7QP site used for the N7GP operation. The EAARS communications bus and the 2.4 GHz wireless Internet link antenna. HyGain 204BA and 40M and 80M double extended Zepps for the CW station. Brett, KE7DVB operating the SSB station. Steve, N2IC operating the CW station. View of the local Arizona high desert scenery with Ash Peak (the prominent local landmark) in the center. The Graham/Greenlee County line goes directly over the top of Ash Peak.